Although he’s become the most recognized figure in Japanese animation, when Hayao Miyazaki was a college student, anime didn’t command anywhere near the level of artistic respect it has today. But while his university didn’t have a manga or anime club, it did have one for children’s literature, which perhaps explains why so many of Studio Ghibli’s films, including Kiki’s Delivery Service, Howl’s Moving Castle, and When Marnie Was There, are adaptations of novels for young readers. Back when Ghibli was just a twinkle in Miyazaki’s eye and his hair was yet to turn a snowy white, he had his sights set on the most well-known series of books from Swedish author Astrid Lindgren, Pippi Longstocking. It’s not hard to see why, either. Pippi seems like just the sort of free-spirited yet earnest character Miyazaki loves to place front and center in his stories. Together with fellow animator Isao Takahata, who would later go on to direct Grave of the Fireflies and The Tale of Princess Kaguya, Miyazaki met directly with Lindgren in 1971 to ask permission to move ahead with an anime starring the character. Ultimately the author declined to give her consent and the project was scrapped, but thankfully not before Miyazaki had already produced several pieces of concept art. This artwork has been collected and published in the softcover book Maboroshi no Nagakutsushita no Pippi, or The Pippi Longstocking that Never Was. The book is available here through Amazon Japan for 2,268 yen (US$19). Had they been given the go-ahead by Lindgren, Takahata was to have served as director, with Miyazaki taking charge of the animation layouts and Yoichi Kotabe, who would later work with the pair on the 1974 Heidi, Girl of the Alps anime, as character designer. ▼ Can’t have a Miyazaki anime without at least one flying machine, right? ▼ Reverence for nature? Check! ▼ Pippi’s unexplained super strength, which allows her to one-hand her horse over her head, was apparently going to be carried over from Lindgren’s original novels. But while the plans for a Pippi anime never came to fruition, the team did still manage to get some mileage out of the work they’d put in. In 1972, one year after making their failed pitch to Lindgren, Miyazaki would serve as writer for the Takahata-directed Panda! Go, Panda!. The film’s main character shares certain physical traits with the anime Pippi’s design, as well as a name, Mimiko, with two repeating syllables. ▼ Compared to the Swedish novels, Panda! Go, Panda! is considerably heavier on the panda quotient, though. 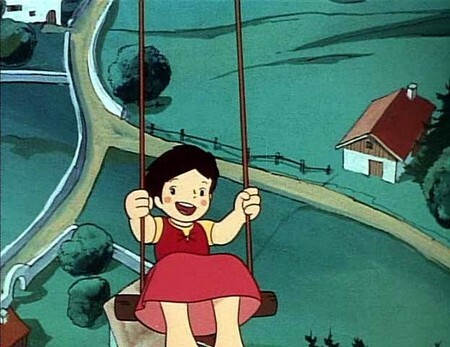 And as mentioned, Takahata, Miyazaki, and Kotabe would reunite in 1974 for Heidi, where the titular girl of the Alps would make use of the swing Miyazaki originally designed for Miss Longstocking. After looking at all of this colorful, expressive, and characteristically Miyazaki artwork, fans of the famed animator are no doubt asking just how Lindgren could have turned him down. It’s worth noting that not all authors have been universally pleased with the way their works were handled by Miyazaki or Studio Ghibli, however. Both Kiki’s Delivery Service creator Eiko Kadaono and Ursula Le Guin, from whose novels Tales from Earthsea was crafted, have expressed displeasure with either the process or final product of their adaptations. And besides, even if Miyazaki never did get to make a Lindgren-sourced anime, his son is getting a chance to do just that, with Goro Miyazaki set to direct an animated TV series based on Ronia the Robber’s Daughter, another Lindgren novel, premiering this fall in Japan. You know what? An Alice in Wonderland/Spirited Away mashup actually kind of works!